As a scalping and day trading index futures enthusiast since 2004, I have traded tens of thousands of CAC 40 (FCE) index futures lots each year using American E-mini futures such as the Dow Jones 30(YM), Nasdaq 100(NQ) and S&P 500 (ES) futures. However since 2011, I have gradually moved to scalping and day trading CFDs on the DAX 30 and the Dow Jones 30 while continuing to trade futures on other indices. I've found CFDs effective for an intensive scalper and day trader on some indices because CFDs eliminate many of the shortcomings of scalping futures and day trading. In one sentence, CFDs are attractive for scalping / day trading on the DAX 30 or the Dow Jones 30 and much less attractive on the S&P 500 and the N225M where futures mostly keep their benefits. As always, everything is a matter of measurement and precision. But I hear so much incorrect information about CFDs relayed ad infinitum, I'm going to take the time to say a little about them. Below is my review of the specificities, the strengths and weaknesses of futures and CFDs for scalping and day trading so that you can share my thought process. Many common beliefs will be overturned and so much the better, a trader who doesn't evolve is condemned. But why start trading CFDs in 2011? Why don't scalpers and day traders in futures move to CFDs? Finally what does a futures or CFDs trader want? Becoming a futures trader was the objective of my life as a young trader. In 2004 at 30 years old, after trading for 8 years, I could finally see my dream, I had managed to earn €25,000, the amount needed at the time to open a futures account and so be able to start trading futures in day trading. In fact, in the early 2000s, the derivative product which was the most liquid, the least expensive, with the best image was futures that crushed all its competitors, Warrants, Turbos and other Options. Becoming a futures trader was achieving a sort of aristocracy in trading, we only talked about this on stock market forums, there were futures traders and there were others. Futures traders converged with traders from large institutions, they saw lines of several million euros go in a few seconds... in short, trading futures gave me the impression of being in the big league, being at the top of the trading Pyramid, this impression lasted until 2011 when I discovered CFDs by chance. In early August 2011, the United States of America lost its AAA credit rating and there was panic on the stock markets. I was then mostly trading CAC 40 FCE futures on the European scalping markets which had become impossible to work with. The gap between the ask and bid prices were from 2 to 3 points different practically all day and institutional investors had fled the market, their order books were desperately empty. I can still remember wanting to liquidate 5 FCE lots between noon and 1 o'clock to get the best offer, there were only 5 lots on line and I waited over 6 minutes before a single lot moved. A horrible ordeal for a scalper. Then the market dropped suddenly, leaving me with 4 lots on my hands and a possible tidy profit became a big loss. I had to face the facts, it had become impossible to scalp CAC 40 FCEs. I had already noticed that there had been fewer and fewer people in this market for a few years, and that gaps were more and more frequent, as much on the CFE as on the Dow Jones 30YM futures, but I stuck to what I knew best, scalping futures. A day trader friend then told me about CFDs and said that some CFD brokers, including PRT CFDs, offered a 1 point spread on the CAC 40 while I had double or even triple that with futures at certain times of the day, which made this index impossible to scalp or at least difficult to make recurring profits. I wasn't very convinced, CFDs had bad press at the time because the product had just been launched in France bringing down prices, for example the margins were a tenth of those earned by French equity brokers who were traditionally protected, like Orange when Free undercut internet prices by circulating information on the poor performance of CFD brokers. In short, a little indoctrinated, I cautiously opened an account, telling myself that I was going to temporarily scalp CFDs whilst waiting for the order books to fill up with futures again. And it was a revelation after a few weeks, a few months… Everything which had curbed my performance on futures had disappeared, by trading in the same way, my earnings sky-rocketed… to the point that I divided my scalping and day trading equally between futures and CFDs. This was also an emotional revolution because I mourned the loss of my position as a futures trader, oh how narcissistic, abandoning the aristocracy of trading, detoxing myself of the rumours that were circulating about CFDs. There is no substitute for personal experience. My only regret is not having moved to CFDs sooner. There is a genuine balance in trading both at the same time and also greater security, in the case of problems with settlement prices (Euronext failure), you can switch from one to the other. 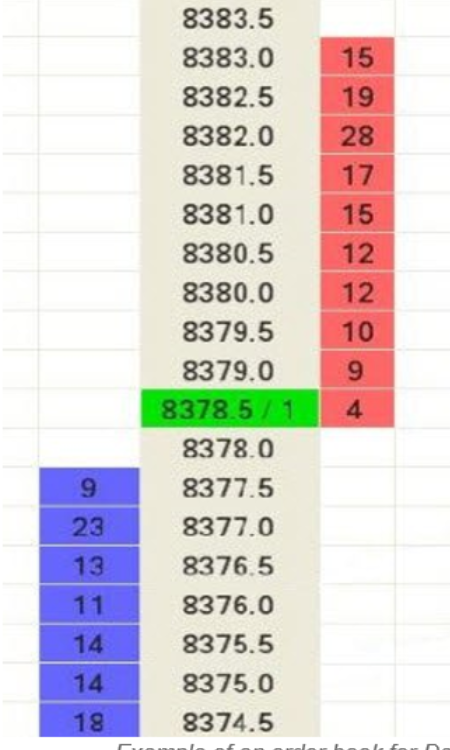 You can see that with a price gap of 1, the bid and the ask no longer meet as before, and if you want to "grab" 20 lots for example, there are 4 lots at 8378.5, 9 lots at 8379 and 7 lots at 8379.5 on the Dax futures which is said to be liquid on futures (for the guys who trade 1 lot?)! With 20 CAC 40 FCE lots, you would currently "break" the order book, something that was unthinkable 10 years ago. People who say that FCE futures are liquid, as I sometimes read, haven't seen a FCE futures order book for 10 years... This example is identical to YM futures on the Dow Jones 30 which has permanent gaps of 2 to 3 points and even more anaemic order books. This has consequences on our trading results: some of the sales and purchase orders are not completed (any more) or only partially completed for futures even if the price is affected. Futures lot sizes are not "adjustable": we can only enter and exit in lots of 1, is rigid, for example we can't enter a profit or loss on a partial lot by clearing 0.25 of the position and leaving 0.75 there as it is. For example, by entering the order books on the Dow Jones futures, I will pay 2 to 3 gap points + round-turn commissions + 1 point tick size. For all inclusive CFDs, I have a fixed spread of 1.8 on the Dow Jones with a tick size of 0.1 … almost half the price. On the Dax, I pay a 1 point spread on fixed round-turn commissions on CFDs with a tick size of 0.1 while on futures I have a 1 point spread on average + round-turn commissions + a tick size of 0.5 . In contrast, futures are much more advantageous than CFDs on some indices such as the S&P 500 or the Euro Stoxx 50; futures are incredibly liquid and you can buy in one click, with no reservations, several tens of millions of dollars' worth. The costs are much lower than on some futures (in particular oil and general raw material futures and those on indices like the S&P 500) even after adding the order book spread and commissions. Generally Futures are much more advantageous if the bid and the ask price "meet". Compared to futures, CFDs have ABSOLUTE liquidity, all that is needed is for the price to be impacted for your transaction to be completed no matter how many lots are involved. This is a total revolution for scalpers and day traders, we no longer have partially completed orders, there are no more problems of orders stacking up in the order book. CFDs have made order books obsolete, CFD brokers guarantee liquidity, that is their problem, no longer ours. Previously between 5% and 20% of my futures scalping trades were not completed, or were only partially completed although prices were impacted, now 100% of my orders are completed perfectly. CFD lot sizes are adjustable, you can buy a 1.17 lot, and partially resell a 0.45 lot if you want. You can adjust the size as you like to the nearest 0.01. There are even more advantages, such as wider time slots than for futures, it is possible to be more aggressive... but this would take too long to expand on. When futures have less leverage, the margins are higher, they are more secure and reassuring. Margin calls can reduce the available leverage and therefore they provide traders with a form of security. You can't "crack" with Futures and get massacred by the use of insane leverage as you can with CFDs. They are therefore more "secure". Because of lack of information, lack of curiosity, comfort and habits... the idea that futures are better than anything else is getting old. In the meantime CFDs arrived and started to shake up the market and its habits. To start with, CFD brokers had bad press, especially in France, which explains why understanding them was delayed. French brokers attempted to preserve their margins by casting doubt on the newcomers' qualities and the world of CFD brokers is indeed vast. There are about 5 CFD brokers who dominate the market, they are powerful, often quoted on the stock market, monitored, audited and inspected, and some are worth billions. They are regulated by the AMF and the ACPR (French independent financial administrative authorities). Their accounts are guaranteed, segregated etc. One of these CFD brokers is more powerful than the Paris stock market in that they do 4 to 5 billion euros worth of transactions per day whilst the Paris stock market has difficulty to exceed 3 billion euros per day... There are also unregulated CFD brokers in tax havens who are more akin to crooks than to brokers. Reliable CFD brokers suffer from the poor image of these companies which are brokers in name only. The choice of a CFD broker is fundamental, not all of them offer the same range of services and protection. You should take your time and do your homework. The best option is to choose a broker listed with the AMF and ACPR, you are then sure to have a reliable broker, regulated by competent people. Steer clear of Cypriot brokers regulated by the Cysec. Not all CFD brokers offer the same services. For example, my CFD broker offers fixed and guaranteed spreads with a spread of 1 on CAC 40, Dax 30, etc. This means that if there is a market panic, the spread stays at 1. Other reliable CFD brokers also offer a spread of 1 on the Dax or CAC 40 but it is not guaranteed, so if there are unforeseen events it can increase to 2, 5, 10, etc. That makes all the difference between a spread of 1 and a guaranteed spread of 1. Be that as it may, there is a transformation on the market that many traders, in either futures or shares, still have difficulty in understanding. You only need to look at the volumes of futures traded in the last 10 years on the CAC 40 FCE to understand that the wind is changing... and you will see that trading volumes on alternative platforms have sky-rocketed. A trader wants to have low fees, absolute liquidity, no slippage, a guarantee that prices are perpetually tradable, to be sure of being able to enter or exit the market when he wants with as many lots as he wants, to be able to choose lot sizes, to have his accounts guaranteed in case of bankruptcy, etc. AMF and ACP regulated CFDs brokers offer this. I talked about this to my friends in futures, I often feel they are reluctant due to the "status of futures traders", which is highly valued in the public imagination, but those who try it often switch from futures to CFDs very quickly. For example I can't imagine going back to only scalping futures, I would really feel that I was going backwards. Everything that could swallow me up, my profits on some indices, floating spreads, partially or uncompleted orders, difficulties with entering or exiting unsettled markets, etc. all that has disappeared. I have my fixed and guaranteed spread, impacted prices, and my orders are completed irrespective of the number of lots. My scalping is now incredibly fluid. I buy and sell when I want, in the amount that I want, I manage my positions much more keenly by splitting my lots to almost 0.01, and I no longer have 0.5 tick sizes to cover but 0.1. Admittedly, my transition from scalping futures to CFDs sky-rocketed my profits on some indices. I prefer to abandon my poor aristocrat's title of futures trader to profit from CFDs and the additional revenue that they give me. It's a question of efficiency... even more so as I continue to trade in futures. We shouldn't pit CFDs against futures but take advantage of their synergy. In conclusion, I recommend that scalpers and day traders trade both futures and CFDs, or at least have the curiosity to put it to the test. On some indices CFDs are more advantageous than futures, although they have absolutely no advantages on S&P 500 or N225m where the shortcomings of futures no longer exist and where they are less expensive to trade than CFDs. There are slight differences that I have rarely seen, as people like to generalize so much (but it is true that there have been few active traders practising in France, 50,000 maximum in the 4 million visitors to the largest stock market forums per day who often talk about things that they know nothing about). The simplest test is to ask them how many lots are there on the first lines the DAX 30, YM or ES. Most of them don't know, they have never ordered through these media or seen an order book, etc. But they have been talking and talking and spouting the same nonsense ad infinitum for 10 years. It is not because a majority of users who don’t trade repeat what they read on websites maintained by webmasters who don’t trade that his information is true J.Sometimes you need to think for yourself and try things out... and really understand that 80% of the people who linger on stock market forums are not traders or are ex-traders. Nothing is all black or all white, it is obvious that, if you want to trade, DAX 30 CFDs are more advantageous (and this is coming from a former Dax futures trader for a hedge fund ... who some days traded 0.10% to 0.50% of the DAX futures' daily volume….) and that if you want to trade on the S&P 500, Nikkey, futures are much more advantageous. Let's be smart, this is our livelihood. But this was a revolution for my trading and my results on the DJ and the DAX. On the S&P 500 and oil futures, it would have been a disaster to move to CFDs. The French are always resistant to new things, but even Minitel was eventually abandoned for the Internet in 2004, there is a long way to go (in France). Therefore futures are better for ES STOXX N225m for example and CFDs with a guaranteed spread are better on other indices. And the thing that makes the most sense (security...) is to have two trading accounts for CFDs and futures as I do with ProRealTime CFD and ProRealTime futures, I have the benefits of both and more security because, hypothetically if Euronext stops quoting (which unfortunately happens too often), you can always switch to CFDs and vice versa. Are you cut out to be a trader? What broker would you recommand for CFDs? 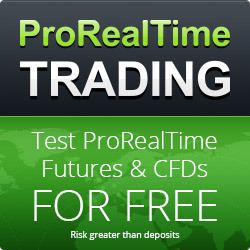 - can you trade 500 eur / points (20 lots) and the liquidity still not an issue on CFDs? What CFD broker do you use/prefer scalping DAX30? Now I called PRT and they told me that I would have problem trading a large amount oc DAX CFDs and the I could experience slippage. What are your experience of the matter. For exemple a large amount would be the equivalent of 10 futures i.e. 250 CFDs.